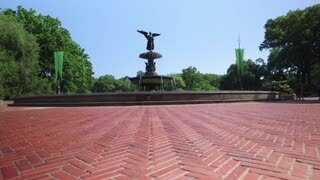 A slow low angle dolly establishing shot of Bethesda Fountain in New York City's iconic Central Park on a summer day as tourist mill around in the distance. A tracking dolly up shot of Bethesda Fountain in Central Park. NEW YORK CITY - Circa June, 2017 - A rising dolly up establishing shot of Bethesda Fountain in Central Park. 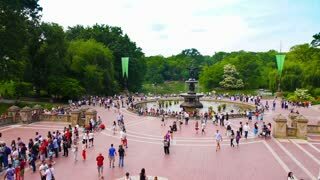 A wide dolly shot of unidentifiable tourists visiting Bethesda Fountain in New York City's iconic Central Park. Shallow depth of field insures anonymity. A slow dolly establishing shot of a railing on The Mall in New York City's iconic Central Park. Shallow depth of field with unidentifiable tourists in the background. 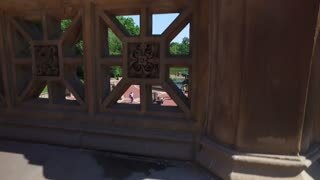 A slow dolly up reveal establishing shot of Bethesda Fountain in Central Park on a summer day. Unidentifiable tourists and rowboats on The Lake in the distance. A long dolly shot of unidentifiable tourists visiting Bethesda Fountain in New York City's iconic Central Park. Extreme shallow depth of field insures anonymity. A slow left-to-right dolly reveal establishing shot of Bethesda Fountain in Central Park on a summer day. Unidentifiable rowboats on The Lake and tourists in the distance. 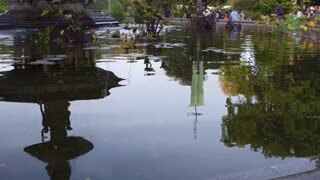 A slow dolly reveal establishing shot of Bethesda Fountain in Central Park on a summer day. Unidentifiable tourists and rowboats on The Lake in the distance. 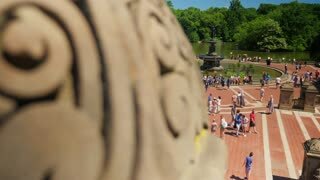 NEW YORK CITY - Circa June, 2018 - A slow left-to-right dolly reveal establishing shot of Bethesda Fountain in Central Park on a summer day. Rowboats on The Lake and tourists in the distance.